The summer of 2012 has been our busiest to date, with 4 large green oak framed extensions raised in Cornwall, and several smaller projects filling in the gaps. Each one is different to the others, being custom designed to meet the needs of the client, and to tie in with the existing building. 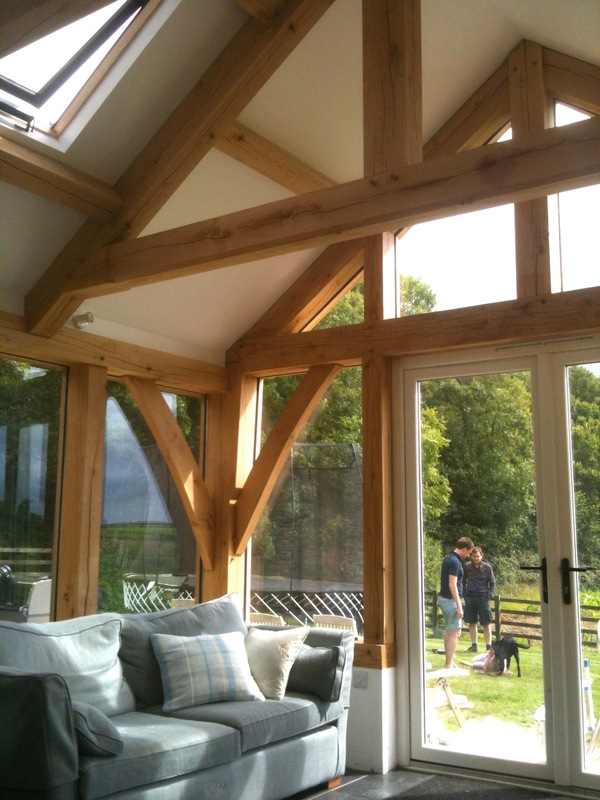 In all these examples we've worked alongside teams of high quality builders; they take care of the groundworks, footings and base, then we raise the oak structure on top of this. They then put the roof on, we glaze where necessary, then its left to them to insulate, plaster, paint and finish. We all know each others needs and schedules, and it's great to go back and see the projects finished to such a fine standard. I worked alongside architects Catchfrench Design on the above extension to this farmhouse near Helston, with Trethowan Builders making a fine job of the stonework and interior finishing. Its nice to work with a teams of designers who I had first heard of sometime ago, and then to meet and collaborate with another team of quality local builders. Hopefully the end result conveys our combined experience in this type of work. Regular architectural collaborator Mark Datson drew up the designs for this pair of handsome extensions to this property on the Roseland, marking our 10th project working together of the last 5 years. We chose to use slightly smaller section timbers here to reflect the existing characteristics in the house, as opposed to the chunky section oakwork in the Helston build. Mark Datson was also the architectural consultant on the hipped extension to this property in Portloe, and Poore & Sons the builders carrying out the massive renovations needed. There's a little way to go yet but considering the weather this summer, and the degree of underpinning and rebuilding need, they've done very well. There's a couple of extra bits to go in here too, a curved oak lintel over the fireplace, and oak beams and braces across the carport entrance...it'll be nice to get finished photos in the spring.